This is the last piece (other than my thesis, which I have yet to publish) from my trip to Honduras in December 2009. I’m really happy with it… Enjoy! Quick update, this story got picked up by CBC radio’s Dispatches program, more information here. A Campa Vista home with a view to the ocean. Photo by Dawn Paley. I’m sitting with the cab driver who has brought me to the end of a long gravel road, near the edge of Trujillo, a small town on the north coast of Honduras. He’s flipping through a newspaper, telling me in halting English that he’s saving up to buy an excavator. Anyone with an excavator has work, he says. I hear the sound of four-wheeled all-terrain-vehicles in the distance, humming as they near. In a cloud of dust, Cathy Bernier appears at the top of the hill, followed on another ATV by her two daughters. All of them are here for a vacation from a freezing Alberta December. Bernier, who works as a client-relations manager with the development, has agreed to take me on a tour of Campa Vista, a housing project for retired Canadians perched above the Caribbean Sea. With a wave from a security guard tuning his radio in a tiny booth, we pass under the front gate, a cement arch built over a dusty gravel road. From the back of Bernier’s speeding ATV, her blonde hair blowing in my face, I can see that the route we’re on is cut through what was quite recently a thick jungle. Along one side, a high wall of earth shades the road, and on the other, a steep ditch drops away toward the ocean. Peeling around a corner, the road forks. We hang right, and Bernier slows to a stop in front of an imposing house with a pool set in the front patio. Within a few months, this house will be occupied by a 70-year-old rugby player from Edmonton—one of this gated village’s first residents. Below us, dense jungle sprawls down the mountain toward the water, interrupted only by the newly built roads, faint outlines of staked-out lots, and high power lines. Here’s my latest, for the North American Congress on Latin America. A new round of democracy promotion projects funded by the United States in Honduras could prove to be a crucial reinforcement of the political project proposed by Honduran coup backers and the country’s business elite. USAID, based its latest $2 million disbursement to Honduras, announced in July 2010, on the policy goals set out in a document called the Country Plan (Plan de País), a set of policies adopted in January, 2010 during the de facto presidency of Roberto Micheletti Bain. I figured I might as well share a couple of pieces I’ve worked on over the past little while. First, my testimony before the Standing Committee on International Trade on the Canada Colombia Free Trade Agreement. The deal has passed now, and many witnesses including Indigenous Colombians and Afro-Colombians were never given the opportunity to speak. I spoke mostly about Calgary based oil and gas companies and their connection to the politicos pushing the deal. 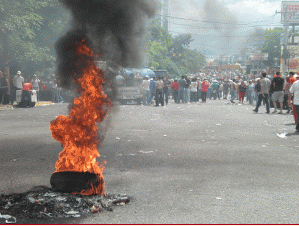 After I gave the testimony, riot police broke up a strike in the south of Colombia, and I adapted it to write this piece. It is an absolute shame that the Canadian government has signed a deal with the Uribe/Santos regime that will likely enable the U.S. government to pass a similar agreement, which will mean more Colombians murdered, disappeared, tortured and displaced for profit. Second, a talk I gave yesterday evening about Canada’s evolving relationship to Mexico. It touches on Canada’s hypocrisy regarding visas for Mexicans, Felipe Calderón’s recent meetings with Stephen Harper, mining, biofuels, and climate change policy, as well as resistance and our hopes for survival. Finally, I wrote a quick analysis piece on the Toronto Declaration, the final document of the G-20. If you second guessed why folks were in the streets to resist the G-20, have a look. Here’s a piece I just completed for the North American Congress on Latin America. The first anniversary of the June 28, 2009 military coup in Honduras might just slide under the international radar, timed as it is right after the Honduran national team kicks off at the World Cup. The Honduran business community could hardly have planned it better themselves. My latest, in Briarpatch’s May/June 2010 edition. For the last 10 years, Juana López Nuñez (not her real name) has spent most of her waking hours making T-shirts for the Canadian company Gildan Activewear at the company’s San Miguel factory in Honduras. Today, at age 44, she has little use of her arms and experiences constant pain in her shoulders, neck and hands. She takes painkillers throughout the day, and has had one surgery, which didn’t ease the chronic tendonitis that keeps her up at night. “I thought that when I started to work for a company, it would make life better. I didn’t realize that I was going to get injured,” she says, holding back tears. López is a single mother of five children, including a 10-year-old daughter who helps her with housework. She makes the equivalent of $47.50 a week. López isn’t the only Gildan employee who is facing troubles at the workplace. “The others don’t want to talk. They are scared and they don’t say anything,” said López. “They are scared to talk to the management because they think they will get fired or get a lower grade of pay,” she said. A piece I did for Z Magazine’s February 2010 edition. The last Sunday in June began normally for Evangelica Argueta, an organizer with the General Workers Confederation (CGT) in Honduras. She woke up in her home in San Pedro Sula, prepared breakfast, and got ready to head to church with her family. Afterwards, they were going to go vote in a non-binding plebiscite about what Hondurans call the cuarta urna (the “fourth urn”). If passed, the cuarta urna would have put a fourth question on the November 29 ballot, asking Hondurans if they were for or against beginning a process of constituent assembly to rewrite the Constitution of Honduras. But what was supposed to be a day celebrating popular participation ended up being what Argueta describes as the darkest day in Honduran history. At 7:00 AM, as Argueta was about to go out the door, she heard on the radio that there was a military coup against José Manuel Zelaya Rosales, the elected president of Honduras. “We heard that there was a coup d’état at 5:30 in the morning, that they shot up the door of his house, and he had been removed in his pajamas and taken to Costa Rica,” she said. Instead of going to church, as she had every Sunday, she went immediately to the central park. By the time Argueta arrived, there were already other labor organizers and social activists there. Argueta describes outraged people arriving continuously, without having been convened by anyone. 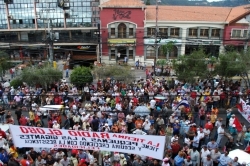 Organizers checked in with their counterparts in Tegucigalpa, where people were also gathering in what would be the first of hundreds of protests against the coup. Dawn Paley, The Dominion, January 8 2010. SAN PEDRO SULA, Honduras—Last summer’s coup in Honduras put the small, Central American country perhaps best known as the original banana republic, back on the map. In the months since President Mel Zelaya was removed from his home by the military and flown from the Honduran capital to Costa Rica on June 28, much has been made of the crisis. Hundreds of thousands of Hondurans have protested the coup, denouncing the military, the local oligarchy and the US as the main perpetrators of Zelaya’s removal. Radio Globo, raided by military and driven underground, is back on the air. For TheTyee.ca, 13 Dec 2009. Running any kind of business during a coup d’état isn’t an easy chore. Running a commercial radio station that speaks out against the military and the interruption of democracy in the eye of the storm is an even more daunting — and dangerous — task. 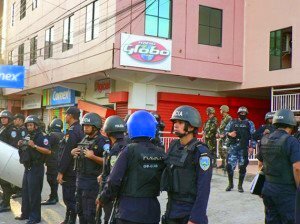 For the journalists at Radio Globo in Tegucigalpa, Honduras, the months since the June 28 coup d’état have meant death threats, raids by the armed forces, the destruction of transmitters, confiscation of equipment, and a presidential decree designed to shut them down for 22 days. The station is on the second floor of a corner building on a busy street, just outside of the city’s downtown core. It is bare other than basic amenities and a two room broadcasting studio. The smell of gasoline permeates the station, and two generators in the corner of the station manager’s office are a reminder of the reoccurring electricity cuts imposed by the de facto government.